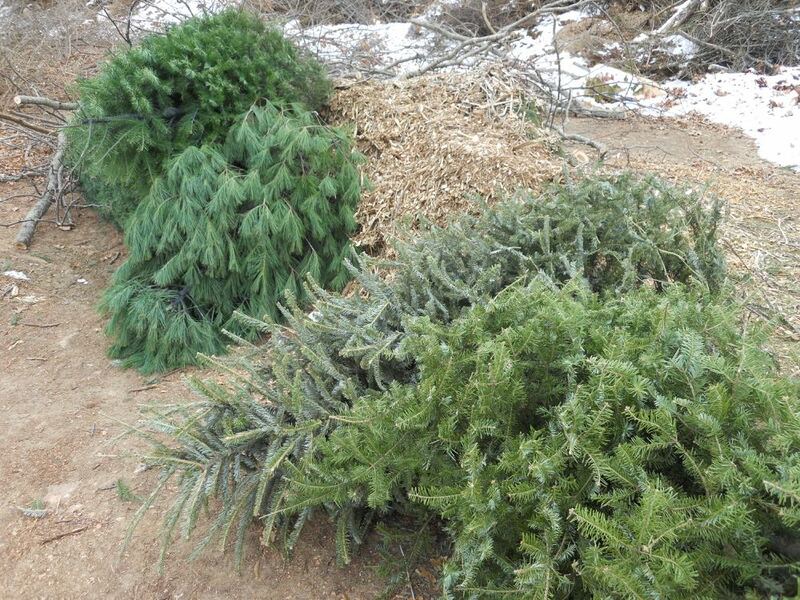 Some of the cut Christmas trees left at Rolla Recycling Center to become mulch. Some friends are finally taking down their fresh cut Christmas trees and tossing them into garbage piles. That's a shame because these trees can easily be recycled and keep contributing in a variety of ways through the rest of winter. 1. Cut branches off and pile them into a small teepee shape at the corner of your property for wildlife refugees. I keep several piles around my one-acre hillside and keep them "refreshed" with twigs and other cover through the seasons so wildlife have a protected hiding space. In spring, it's fun to see what comes out of those refuges. Last spring, I saw a number of rabbits making the wildlife piles home. 2. Cut Christmas trees also make good bird cover under bird feeders. If you don't like having a whole tree at a bird feeder, cut off branches and use the branches to provide a green safe space at the foot of a bird feeder. 3. Better yet, use the cut Christmas tree as a bird feeder. Place the tree up against a post or tie it to another tree and add orange slices, strung popcorn, old cranberries and even a bird feeder to give birds a safe place to eat. One of the most beautiful garden sights in snow is to see red cardinal birds in the evergreen branches of a cut Christmas tree! 4. Striped Christmas tree trunks can be set aside to weather and then used as fence posts and bird feeder poles. Chipped trees and donated branches become a gardener's dream, a pile of potential mulch! 5. Donate your cut Christmas tree to your local recycling center. 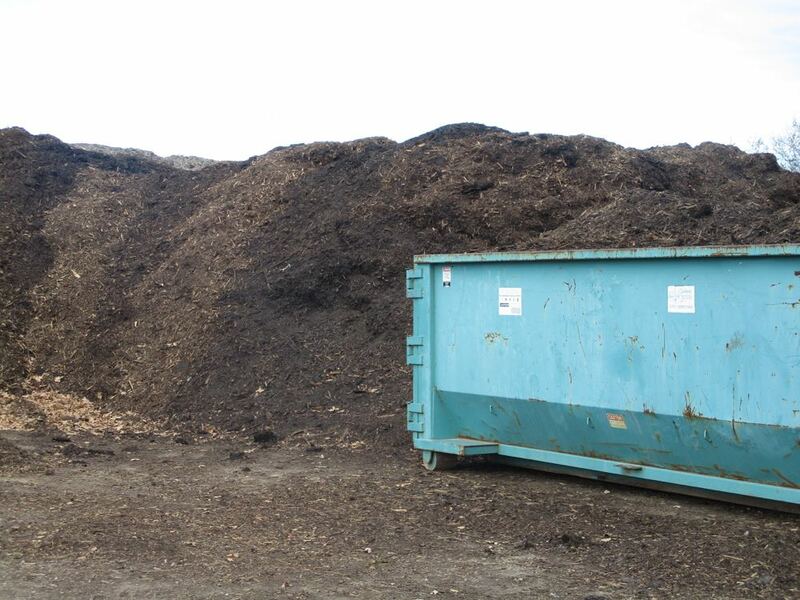 The Rolla Recycling Center collects trees and chips them up into huge mulch piles that sit through the rest of winter waiting for spring. When weather warms up, residents can stop by on Wednesdays to have the loader fill their pick-ups and trailers with the chipped wood for garden mulch. The mulch is also available the rest of the week but you have to shovel your own so Wednesdays become a popular day to visit the recycling center. 6. Tie a weight on the cut Christmas tree and sink it in your ponds for fish cover. Evergreen trees make good cover for baby fish as well as providing safe hiding spaces for larger fish trying to get away from predators. 7. Two years ago, a local garden center was giving away their cut Christmas trees so I picked several up and used them for a wind break around my honeybee hives. Cut Christmas trees also make good wind breaks around honeybee hives facing the south. 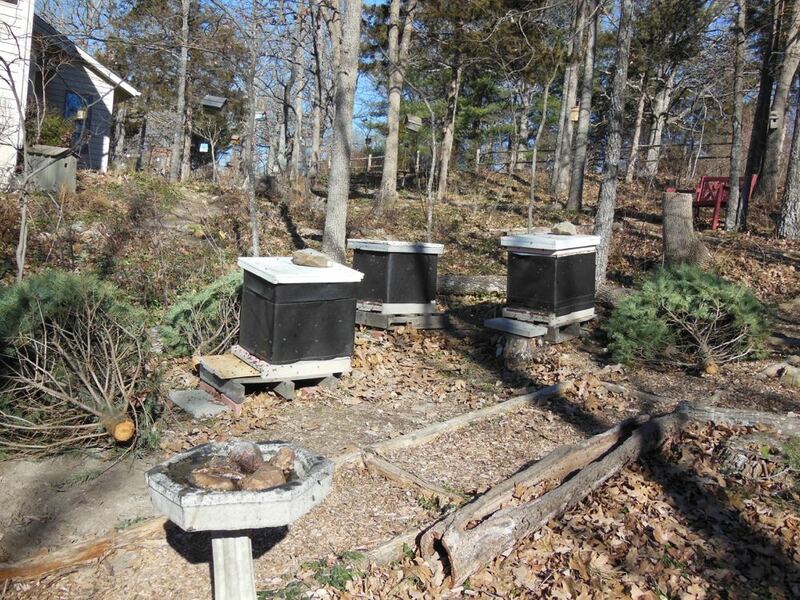 In the photo I have the trees pulled away from hive entrances so the honeybees can easily take their winter cleansing flights. As soon as the temperatures dropped to make them cluster back inside the hives, I moved the cut Christmas trees back in front of the hives for a wind break. Here's a closer look of one of my hives with bees taking cleansing flights. It takes a while for evergreen trees to dry out, even if they aren't placed in water so you have about half a year of good use before the branches become brittle.